A confession: I’m not really much of a college basketball fan, but I absolutely LOVE March Madness, or the NCAA Men’s Basketball Tournament as it’s more formally known. I love how any division I school has a shot at making “the big dance” if they just win enough games. I love the Cinderella stories. Give me North Florida, Dayton, Belmont or Hampton. I love the fact that some “Cinderella stories” return year after year until they are acknowledged by the pundits as powerhouse programs like Gonzaga or Butler, or even Villanova was once upon a time. Even for the experts, who analyze this stuff for a living, the tournament is a crap-shoot. It is a one-game elimination tournament. College basketball only plays two halves, so things can change as quickly as lightning strikes. The last few years I’ve printed off a tournament bracket and tried to pick the winners before the tournament begins. Like millions of others, I usually throw my hands in the air during the first day of the second round, as my bracket lies in ruins. 2nd round: 23/32/ 72% Pretty impressive, I think considering I don’t even follow the game much. 3rd round: 9/16. 56% At this point, I’m still ahead of President Obama’s bracket. 4th round 5/8. 62% Woah! UPDATE 3.29.15: 5th round 2/4. 50%. 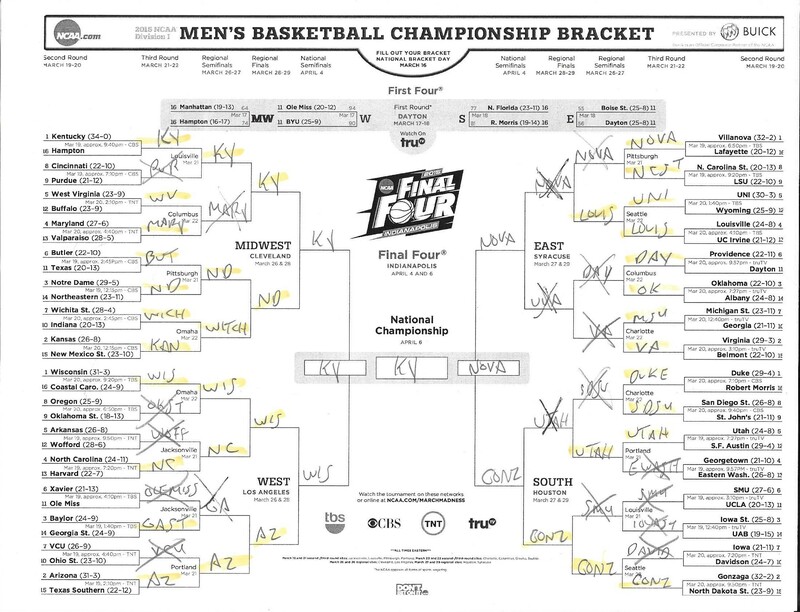 One side of my bracket is now completely shot. On the other hand, I did successfully predict the elite 8 and final four teams from the regions. Maybe I’ll even try one of those online challenges next year.